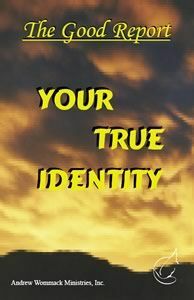 This mini magazine is a compilation of articles on the topic of your identity in Christ. There is an identity crisis in the world today. Mankind is only a shadow of what God created us to be. Most people have become so accustomed to being miserable that they don't know what they are missing. They don't realize from where we've fallen. Modern man believes he came from monkeys and acts accordingly. They practice homosexuality. Even monkeys are smarter than that. They protect the unborn eagles more than their own young. They have lost all sense of who they are and where they came from.